Mandarin oranges are a must in all Chinese families during the Lunar New Year. Our tradition is to bring a pair of mandarin oranges with you wherever you go. You have to give this pair of oranges to your relatives/friends and also to say something good to them. Like, wishing them a Happy New Year, Prosperous New Year, Success in their business/work, Healthy year for them, etc, etc. The other party is supposed to return the good luck, good fortune, good wishes to you by returning you a pair of mandarin oranges too. Isn't this great. You wish others all the good things and in return they return all that you wish for them back to you. 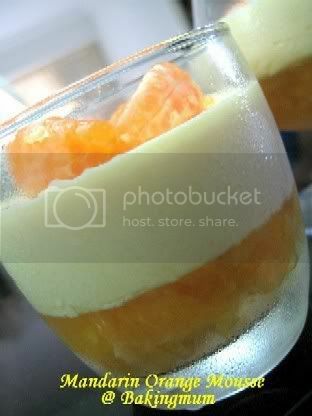 Since I had many many mandarin oranges at home, I attempted this dessert with them. 1. 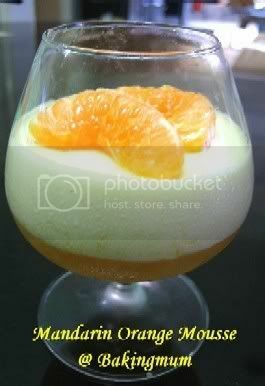 To make the bottom layer, prepare the glasses, place in mandarin orange and red cherry. 2. Cook the jelly powder, water and sugar over a medium heat until boil. Pour into a glass, leave to set. 3. To make mousse, stir orange jouice, gelatine powder and egg yolk over boiling water until thicken. Remove from heat and leave to cool. 4. Whisk the fresh cream until soft peak. Pound the mandarin oranges until finely paste. 5. Pour the fresh cream, mandarin orange paste and Grand Marnier into egg yolk mixture. Stir until to be a mousse. 6. Pipe the mousse into the glasses separately. Fridge it until set. Happy New Year to you and your family...u must be really busy, what with all the new year preparations!! Hi K, Happy New Year. How was your New Year holiday. Hope it was good for you. Happy New Year! May u continue to have more creations in the year of the pig : ) heehee..
Wendy, give me sometime to type it out. I will do it as soon as I can find time ok. I would like very much to try this recipe but my problem is I am only able to buy gelation in pieces rather in powder form. Can you help me? Appreciate very much if you can tell me how many pieces should I use for this recipe? can i just ask you.. wat brand do you use for the fresh cream?? is it the same as thicken cream?? if you dont mind, can you reply me at ucanthandlemebaby@hotmail.com.